A Chausie (also known as Jungle Curl, Stone Cougar, Mountain Cougar) is a hybrid of the domestic cat and the Jungle Cat.Despite their wild appearance, they are domestic. Chausie males typically weigh about 14 - 22 pounds, while females tend to be smaller. They appear to be found in colours of 3- brown ticked tabby, solid black and black grizzled. Their ears are notably special- a large mobile-type. Individuals considering keeping Chausies should be aware of the cats high activity level. They are very loyal to their family and do like other pets. Digestive tract problems have been occasionally associated with this breed; some cats may be gluten-intolerant, and have trouble digesting commercial cat food which contains wheat or other gluten grains. Similar to other hybrid cats, Chausies can take up to 2 or 3 years to reach full size. The size depends on the size of their parents. The females are usually smaller in size. 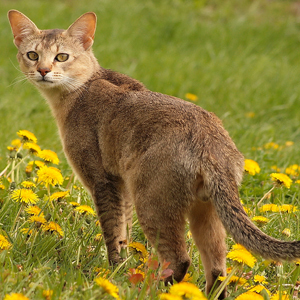 The common weight of a chausie is between 10-22 pounds, when they are full grown. Chausies are known for their speed and nearly six foot vertical leap.